Of the many splendours of Egypt, the Al-Azhar stands as a landmark in its architectural and cultural history, marking the beginning of the Fatimid rule and the foundation of its capital Cairo (Al-Qahira, "The Victorious"). Of the many splendours of Egypt, the Al-Azhar stands as a landmark in its architectural and cultural history, marking the beginning of the Fatimid rule and the foundation of its capital Cairo (Al-Qahira, "The Victorious"). This followed general Jauhar's entrance to Al-Fustat in 969 CE, under the orders of the Fatimid ruler Al-Mu'iz Li-Din Allah (953-75). Al-Mu'iz celebrated his victory over the Abbasids by the foundation of the new capital city not far from Al-Fustat. As customary with Muslim rulers when they built new cities, Al-Mu'iz first founded at the centre of the capital, a main mosque that became known as Jami' Al-Qahira (972). 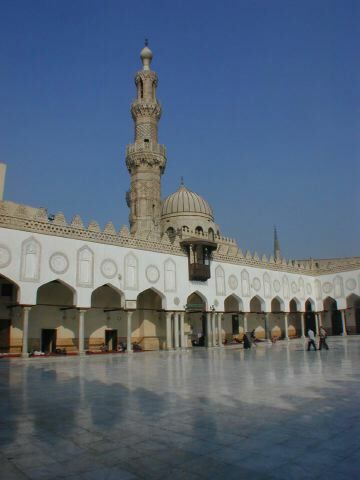 Later, it was renamed Al-Azhar, "The Splendid", an indication of its beauty and magnificence. Al-Mu'iz's successor, his son Al-‘Aziz (975-996), sustained his ambitious building projects and consolidated his reforms giving education a primary importance. Within this strategy he converted Al-Azhar into a theological school in 988 and established more schools including the Hakim and Mustansir universities . Al-Azhar has remained so till the present day although some changes were introduced in its curriculum. Figure 2. 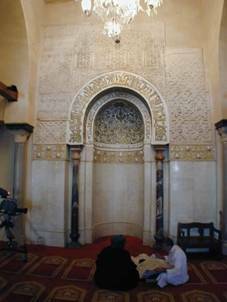 The original Fatimid mihrab was saved from various alterations. The prestigious position of the school among the Egyptian population as well as in the Muslim world drew the attention of various rulers. These rulers whose enthusiasm to improve the status of the mosque marked their legacy behind many of the alterations and modifications introduced. The plan thus, has evolved from these alterations, which despite their positive contribution to the functionality of the mosque, has destroyed much of the mosque's original character. The oldest part of the mosque is the original prayer hall (sanctuary). It is made of five aisles parallel to the old qibla wall with the central nave (transept) cutting through them in the middle, running from the court in the west to the old qibla wall in the east. This reminds us of the North African T-plan mosques, such as al-Qayrawan. This is not surprising as this plan originated with the Fatimids. 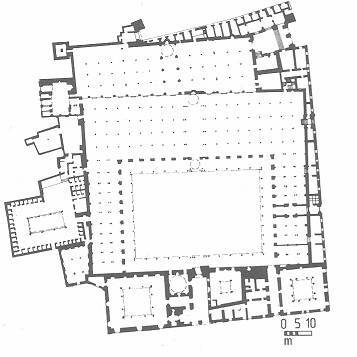 As the aim of this nave was to emphasise the connection with the mihrab, it was made wider than the other aisles and its arcades were carried on coupled columns, culminating on either end in a bay carrying a dome as at al-Qayrawan. The Ottomans removed the old qibla wall in 1753 extending the prayer hall towards the east, keeping the old mihrab in situ covered with restored carved stucco. 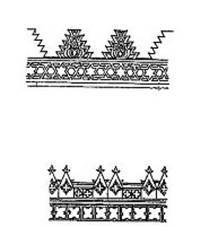 The cul-de-four and the double frame are all what was left of the Fatimid décor . Other Fatimid decoration is displayed in arch spandrels and window panels, mostly consisting of scrolling and meandering vines ending in half palmettes together with tree motifs and calligraphy . Unlike the plan, these decorations bear the eastern influence . During the Ottoman rule of Egypt in the 18th century an extension made beyond the old qibla wall consisted of four aisles parallel to the old aisles. This addition disappointingly failed to keep the harmony of the prayer hall as it was horizontally shortened by four aisles pushing the new central nave to the aisles beyond the old nave, making the depth of the mosque appear with two naves . The flat roof is carried by slender columns connected by four point centred pointed arches. The triangular shaped battlements which decorate the top of the walls, together with those of the Ibn Tulun Mosque (876), provided a prototype for Gothic pierced and crested parapets that were constructed in Medieval Europe . The Ottoman extension also incorporated a number of structures which were attached to outside walls, including a few tombs, cisterns and madrassas along the Northern side. In these conditions, the prayer hall became encircled with these chambers. The western section of the mosque is occupied by a well-ordered courtyard surrounded by porticoes which were added by the caliph Al-Hafiz (1130-1149) . However, to the dismay of the historian, this beautiful courtyard and its entrance was destroyed in 1798. Blaming student resistance, Bonaparte ordered the bombardment of the mosque, showing his little respect for culture and art. Mohammed Ali restored the mosque to its former glory. In 1892 however, the courtyard was renovated again, an act which further destroyed much of its historicity . Further disappointment for what is still considered as one of the most revered institutions of learning in the Muslim world concerns the entrance portal. Only constructed in the 18th Century, the entrance portal was in a Gothic style with recessed multiple round-headed arches flanked by clustered shafts. Figure 5. The mosque courtyard was renovated numerous times loosing it its originality. Hill, D. (1976), ‘Islamic Architecture in North Africa', Faber and Faber, London, p.76. Hill, D. (1976), ‘Islamic Architecture in North Africa', op.cit, p.77. Jairazbhoy, R.A. (1972), ‘An Outline of Islamic Architecture', Asia Publishing House, Bombay, London and New york.p.151. M. Hattstein and P. Delius (eds.) (2000), 'Islam Art and Architecture', Konemann, Cologne, p.147. Briggs, M.S. (1931), ‘Architecture', in T. and A. Guillaume, eds., The Legacy of Islam, Oxford University Press, p.172, and Briggs, M.S. (1924), `Muhammadan Architecture in Egypt and Palestine', the Clarendon Press, Oxford. Michell, M. et al. (eds.) (1978), ‘Architecture of the Islamic World', Thames and Hudson, London, p.224. Jairazbhoy, R.A. (1972), ‘An Outline of Islamic Architecture', op cit, p.151.